Happy New Year. In my earlier post on some of the different ways I have been addressed in correspondence, I confined the list to mail received in Hull. 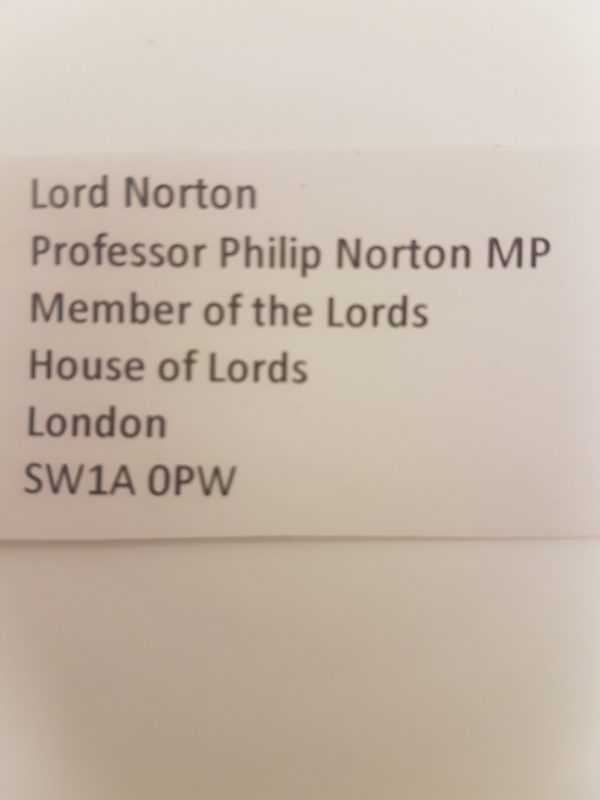 I also get some interesting variations on my name on letters sent to me at the Lords. Sometimes it is the salutation (I variously get ‘Dear Lord’, which at least gets a more sympathetic reaction than ‘Dear Lord or Lady’), but some of the names used on the envelope can be interesting. Some writers sometimes get rather confused as to the correct form of address. As can be seen from the address reproduced (right), one recently appeared to want to hedge their bets, putting me in both Houses. There is a serious point to be made about how envelopes are addressed. Because of the different ways I can be styled (from Professor The Rt Hon Lord Norton of Louth to Lord Norton and all forms of variation (Rt Hon Prof Lord etc.) I can usually recognize when the letters are part of an organized campaign. Although those organizing a campaign will usually advise writers to write in their own words, they usually tell them how to address the envelope, with the result that all the letters I receive are addressed in the same way. When several come around the same time with a common form of address, I know before I open them that they form part of a campaign. Mind you, they are possibly not as obvious as the occasion many years ago when I received over ninety individually-written letters opposing Lord Joffe’s Assisted Dying Bill. How did I know they were part of an organized campaign? All 90+ letters arrived in one big envelope! This entry was posted in Uncategorized and tagged Assisted Dying Bill, correspondence, lobbying. Bookmark the permalink. You can redirect your mail for 3, 6 or 12 months from £33.99 per last name. The question is, then, given the apparent inexhaustible iterations of your handle, what exactly constitutes a last name? And, if LN had to give a change of address it would cost him £33.99 multiplied by however many different ways his name was received. People who moved recently and are close to me had to pay for five different name uses. They have a double barrelled version. So, each different uses had to be covered. Plus for each different member of the family. It is ridiculous. Another example, if another was needed, of sinking into the world of degenerate banana republics. Privatisation is another name for legalised robbery. Add to that the customs charges. A purchases of a used item from the US to the UK costs a minimum of one third of the original price. Used item £240.00 sterling. Duty £100.00. It was returned as the cost of the item was way over the value. The good news is that I am not prone to changing home. I have lived in my house in Hull for nearly 40 years (and my London flat for 30) and have no plans to move. I am not a Conservative for nothing.